POM Amsterdam created this beautiful and comfortable scarf especially for the Van Gogh Museum. The contemporary design is inspired by Van Gogh's painting Landscape with Houses. 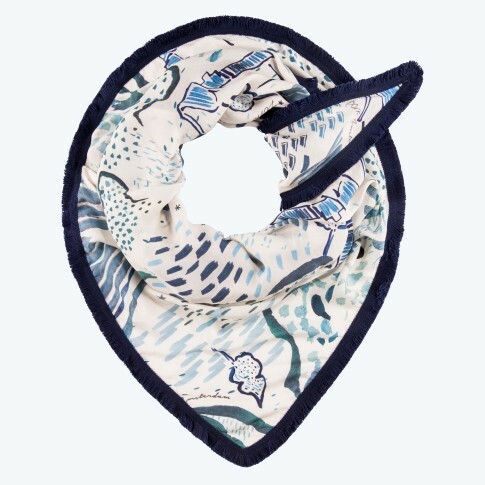 Due to the unique design this scarf can be worn in many different ways. All POM scarves have an asymetrical triangle shape with one long corner and a short one and are finished with an outspoken coloured tape around the edges. Made in 100% cupro, a sustainable fabric from leftover cotton seeds. Soft as silk, breathable as cotton. Soft drapy scarf, made in the EU. Comes in a lovely giftbox.